Art Nouveau was an internationally popular style of art and architecture that reached its peak of popularity around the turn of the 20th century, roughly 1895 through 1905. It was a short-lived movement in its prime, but it remains very prominent over a century later. It features organic forms, curving shapes, features that led to the term "biometric whiplash art", and women represented in a very stylized fashion. The overall design included fonts for posters and signs, furniture, fixtures, and structural elements within homes and other buildings. The movement seems to have gained its popularity largely from one advertising poster displayed along the streets of Paris in 1894. Alphonse Mucha, a Czech graphic artist, had created a poster for the play Gismonda starring Sarah Bernhardt. Alphonse Mucha's famous poster of Sarah Bernhardt in Gismonda, 1894. L'Ermitage illustrated art review cover. Art Nouveau was still a popular style in the 1980s, at least with Stevie Nicks. Bernhardt's enormous fame made Gismonda an immediate success. She also brought a great deal of attention to the poster itself, making it popular on its own. Much like a very pre-1970s Farrah Fawcett, if Farrah had been selling swimsuits. The general style of the poster, featuring organic and other plant-based forms, quickly caught on. 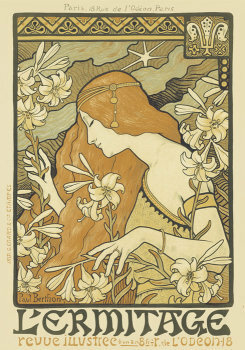 It was first called Style Mucha after its primary developer, then called Art Nouveau. The distinctive style continued to be used in marketing and sales, in advertising posters and in the design of commercial buildings like department stores. For example, it was called Style Liberty for a while because of its use in London's Liberty & Company department store. It was also used in both private and municipal architecture. 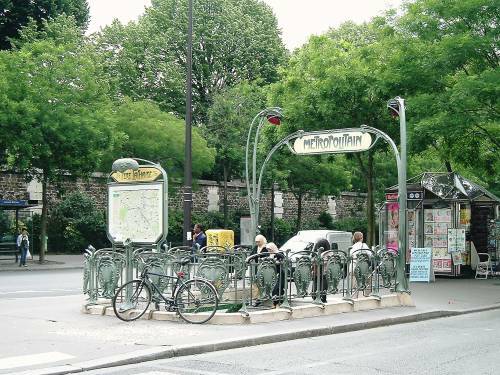 Paris' Métro stations are famously designed in this style by Hector Guimard. 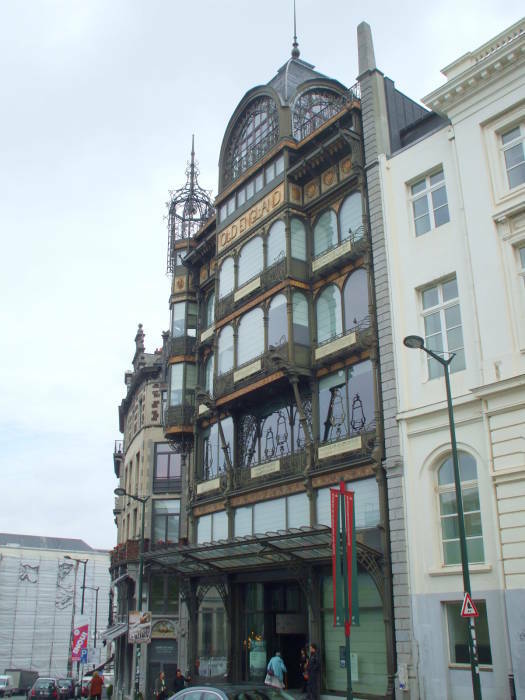 Salavador Dali spoke of "The terrifying and edible beauty of Art Nouveau Architecture." 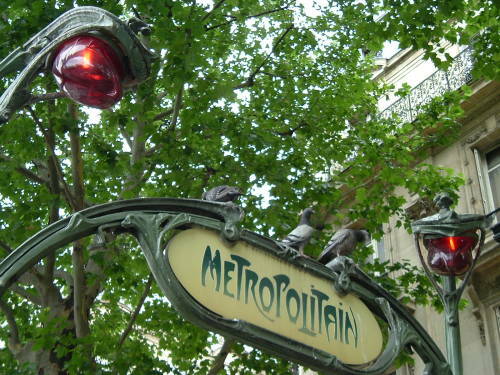 For some reason, the red lamps over the Métro entrances always make me think of the invaders in the original War of the Worlds movie. Maybe that's what terrified Dali. Great minds think alike! Paris Métro entrance at Père Lachaise. Paris Métro entrance at St-Michel in the Quartier Latin. 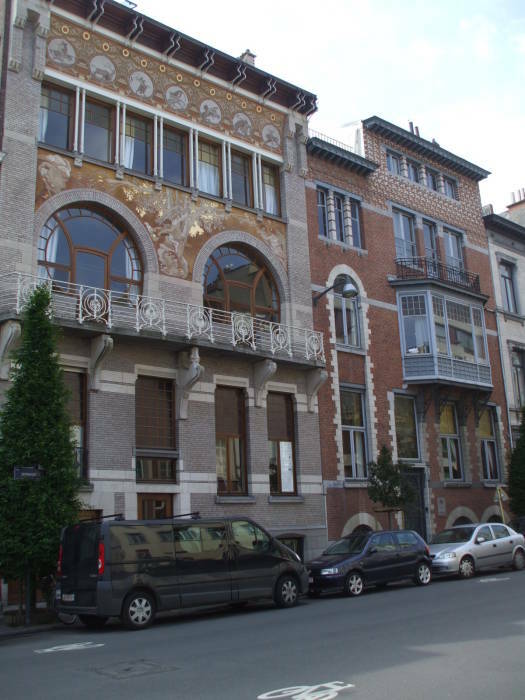 As you can see, many of the Art Nouveau buildings are clustered in the Ixelles district, southwest of the city center and outside Petite Ceinture, the inner ring road. You will also see why the central old town, where the larger labels Brusell (Flemish) and Bruxelles (French) appear, is known as "the Lower Town". Ixelles is significantly higher. 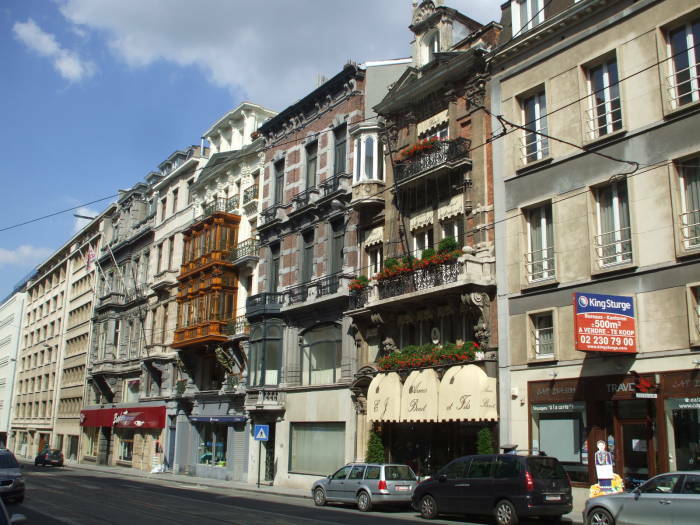 Unlike the grim area around Gare du Midi, and east of there and south into Saint-Gilles, Ixelles is very nice. There are plenty of nice cafes and upscale shops. 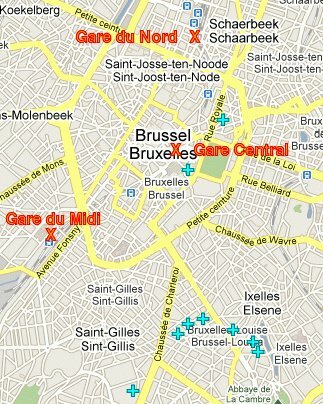 The major street (in yellow on the above map) running to the southeast through the label "Bruxelles-Louise" is Avenue Louise. A tram line runs down the grassy central median strip, making it easy to get there from the center. But it's not a difficult walk, even from the Lower Town. A nice detailed map is available at the information booth in the Gare du Midi, Brussel's main train station and the point of arrival for international trains. 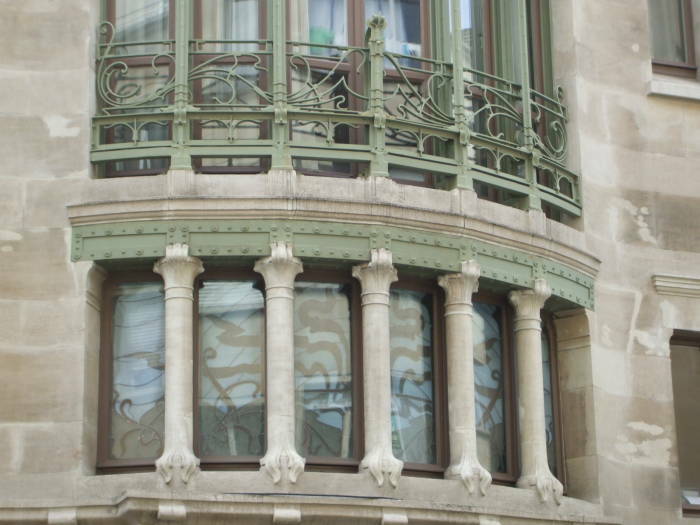 Victor Horta was the primary Art Nouveau architect. The style had spread from posters to decorative arts (that is, furniture and interior decoration). His Hôtel Tassel, at no. 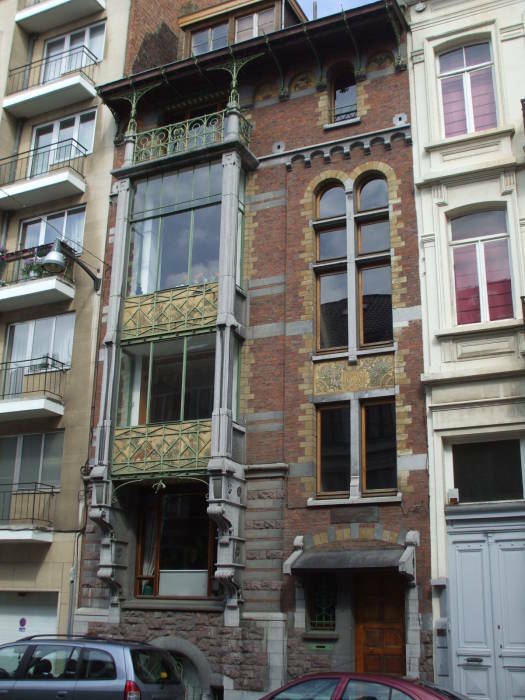 6 rue Paul-Emile Janson, was the first application of Art Nouveau style to architecture. Remember, "hôtel" means "town house" or "mansion". 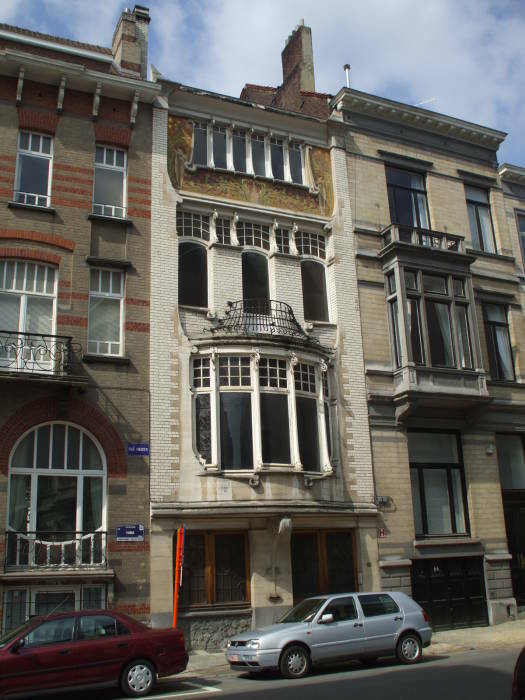 To find it with GPS: 50° 49' 40" N 4° 21' 43.3" E.
Horta was born in 1861 in Ghent. By the time he was twelve, he had helped his uncle on a construction site and become interested in architecture. He studied in Ghent and then moved to Paris, where he was exposed to the emerging impressionist style of art and developments in iron and glass working. He returned to Belgium in 1880, settling in Brussels and continuing his studies of fine arts. He had begun working on his own by 1885, when he designed three houses. 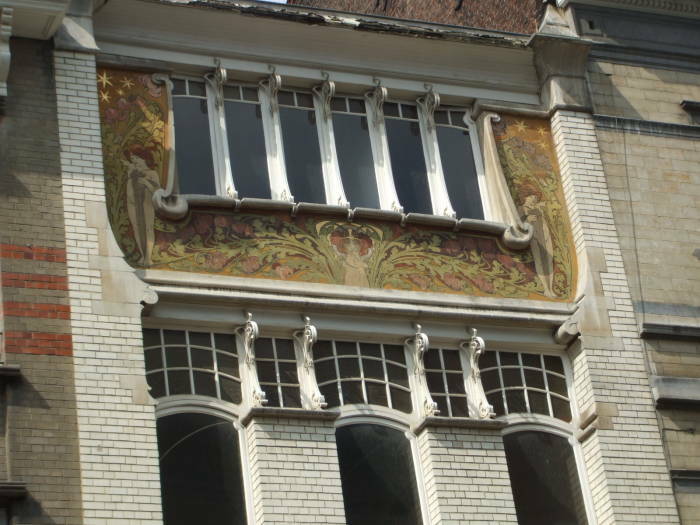 The professor and scientist Emile Tassel commissioned a Horta design in 1893, and the latest Art Nouveau influences appeared in the private residence Hôtel Tassel. This was a year before Mucha's famous and influential poster. The relatively plain stone façade fits in with the neighboring buildings, and the elaborate and ornate designs are hidden inside. 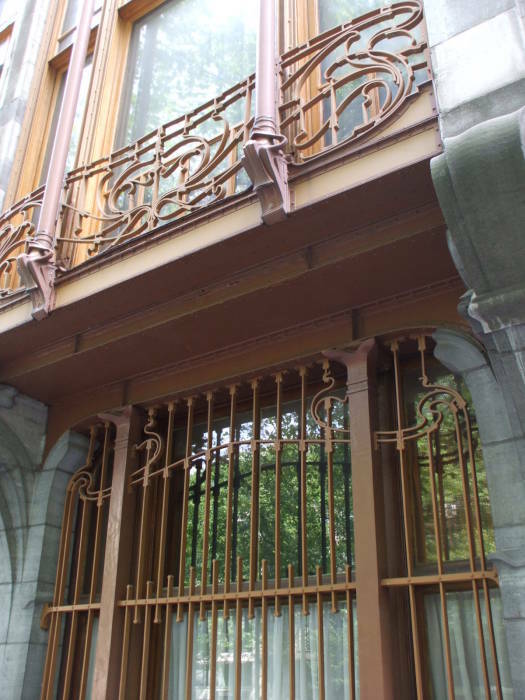 You can see just a little — the organically curving ironwork and the etched glass in the curved bank of windows. Unfortunately, a law firm occupies the building and you cannot see the interior. Horta designed all the interior details — stained glass windows and panels, mosaic floors, handrails and decorative woodwork, and even the door handles and electrical fixtures. In 1898 Horta was commissioned to design a large town house along the broad and tree-lined Avenue Louise. The project was for Armand Solvay, the son of a wealthy chemist and industrialist. 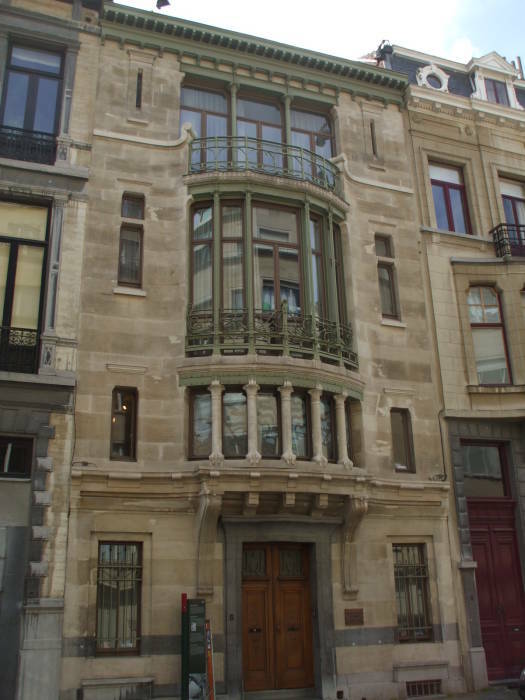 The resulting Hôtel Solvay is at no. 224 Avenue Louise. To find it with GPS: 50° 49' 34.75" N 4° 21' 55" E.
The client was wealthy enough that money was no object for the materials. Various tropical woods were used in addition to an array of decorative stones. The Belgian pointillist painter Théo van Rysselberghe was enlisted to decorate the staircase. 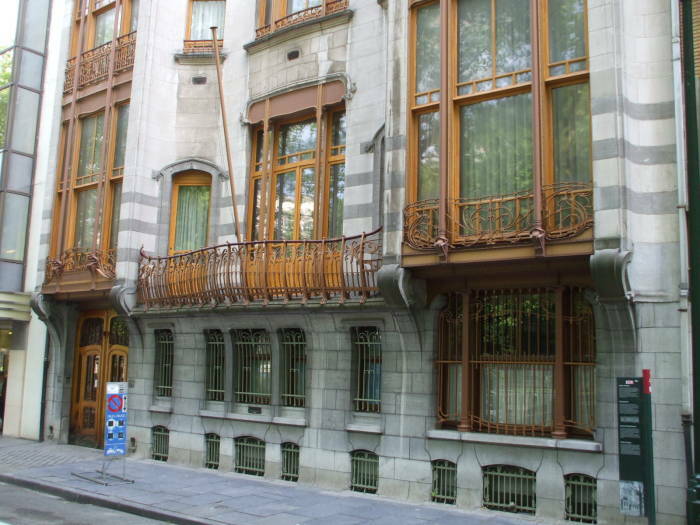 The Hôtel Solvay is privately owned. The good news about this is that the owners have carefully restored and preserved the building. The bad news is that it can only be visited by appointments that seem to be difficult to arrange. 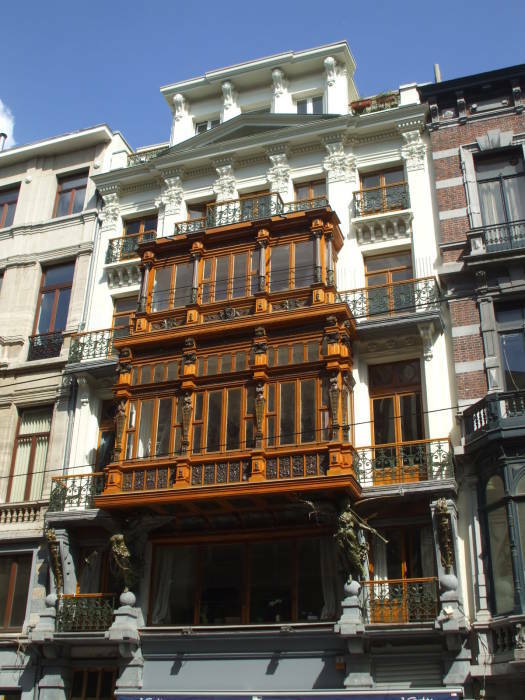 Horta's Hôtel Solvay, no. 224 Avenue Louise. 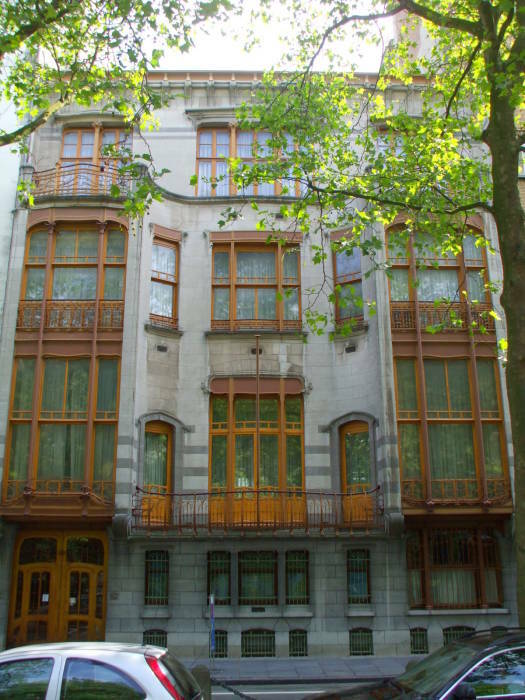 The four major town houses — Hôtel Tassel, Hôtel Solvay, Hôtel van Eetvelde, and Maison & Atelier Horta — located in Brussels and designed by the architect Victor Horta, one of the earliest initiator of Art Nouveau, are some of the most remarkable pioneering works of architecture of the end of the 19th century. The stylistic revolution represented by these works is characterised by their open plan, the diffusion of light, and the brilliant joining of the curved lines of decoration with the structure of the building. 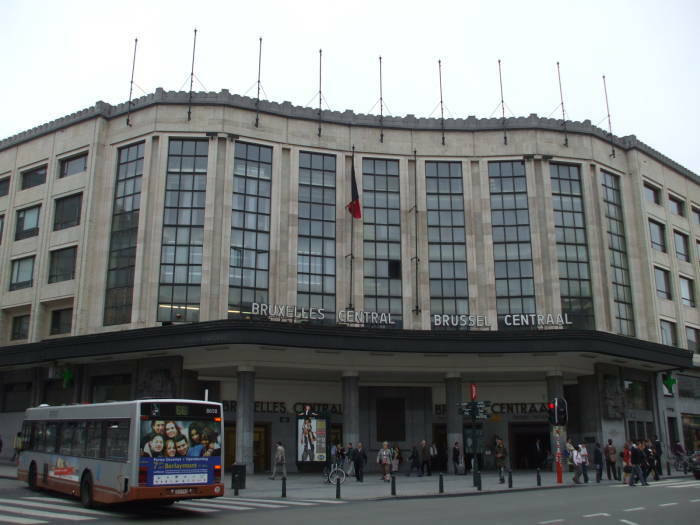 Another Horta design, originally the Grand Magasin Woucquez, at 20 Rue du Sable, is now the Centre Belge de la Bande Dessinée. 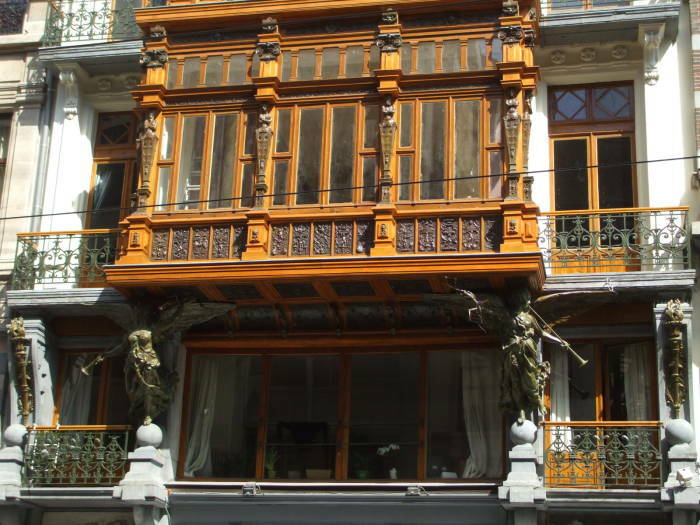 Horta designed over forty buildings. Some were were demolished in the name of progress between the end of World War II and the 1960s, but many remain. 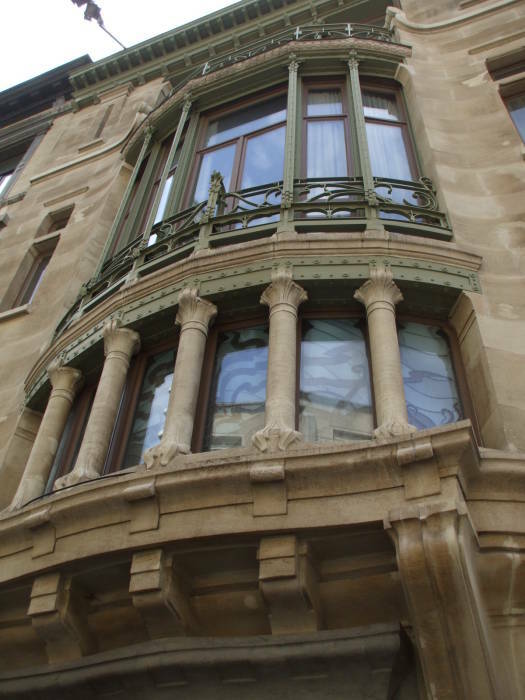 A list of Victor Horta's designs is available. Paul Hankar met Victor Horta when they were studying at the Academie des Beaux-Arts in Brussels. They shared an interest in forged iron, which would feature in the later designs of both. Hankar is another of the primary Art Nouveau architects. His Hôtel Ciamberlani, built in 1897, is at no. 48 rue Defacqz. Yes, "Defacqz." The Hôtel Ciamberlani façade features sgraffito, a technique of wall decoration. Maison Hankar is, obviousment, Paul Hankar's private residence and studio. It's at 71 rue Defacqz. Here we are looking down Rue Faider. 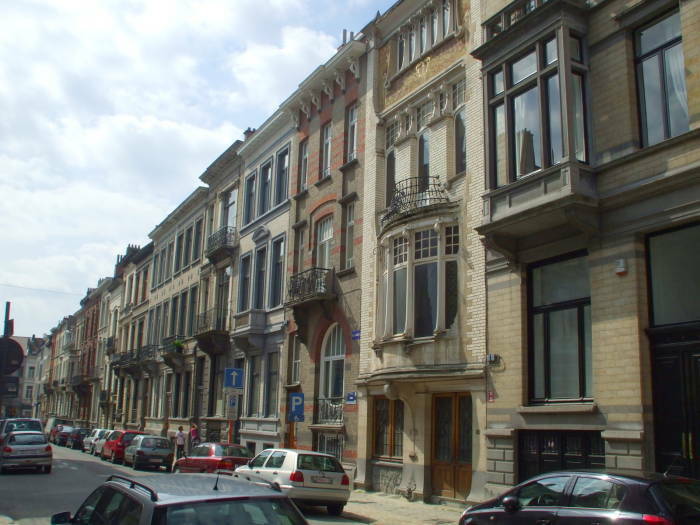 The buildings are built in a variety of similar and complementary styles, but notice the second one from the right with the white brick façde and curving bay of windows. 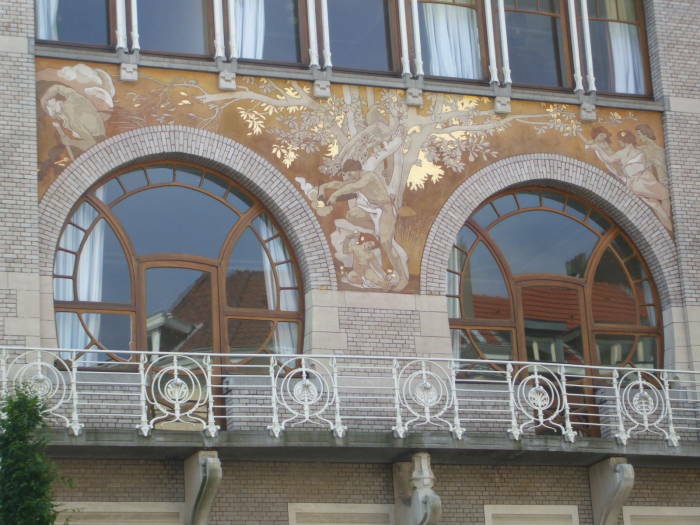 It was built by Albert Rosenboom, and it has some distinctive Art Nouveau details. 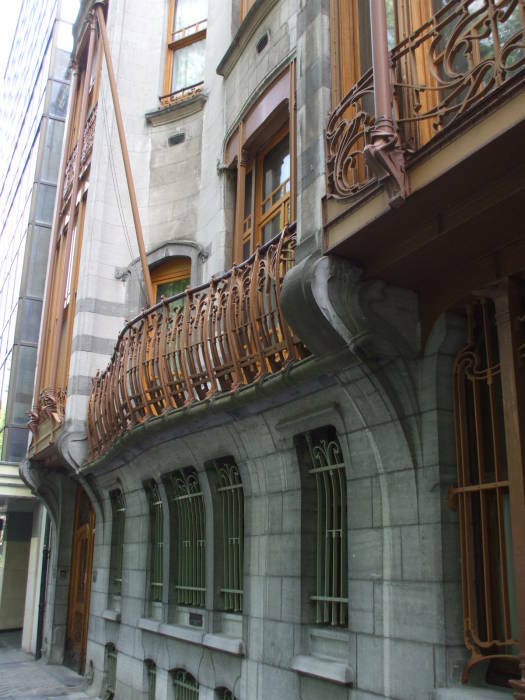 See the organically curving details, the curving ironwork, and the top floor sgraffito on this building at 10 rue Faider. This closer view better shows the sgraffito around the top floor windows. The smoothly curving structural details are made from carved stone components set into brick walls. The Old England building was designed in 1899 by Paul Saintenoy as a department store. It sat empty for several years, but has now been opened as le Musée des Instruments de Musique. This building is at the top of the open-air staircase of the Mont des Arts, on the way from Gare Central to Place Royale and the art museums. Saintenoy was the general secretary of the Royal Society of Archaeology for a time. He began teaching at the Academie des Beaux-Arts in Brussels in 1910. At the end of World War I in 1918, he was appointed a member of the Royal Commission of Monuments and Sites and played an significant role in reconstructing Belgium. Old England Building, no. 2 rue Montagne de la Cour. Designed by Paul Saintenoy. Architecture along the Rue Royale. Walking along the Rue Royale between there and the Lower Town or the cluster of art museums, I passed a place that wasn't really of the Art Nouveau style, but was unusual and caught my eye. 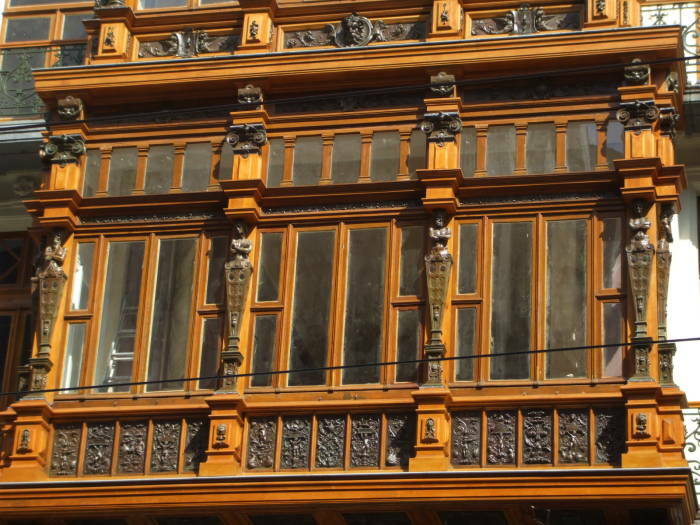 It had an interesting and ornate windowed room extending slightly out from the building façade. 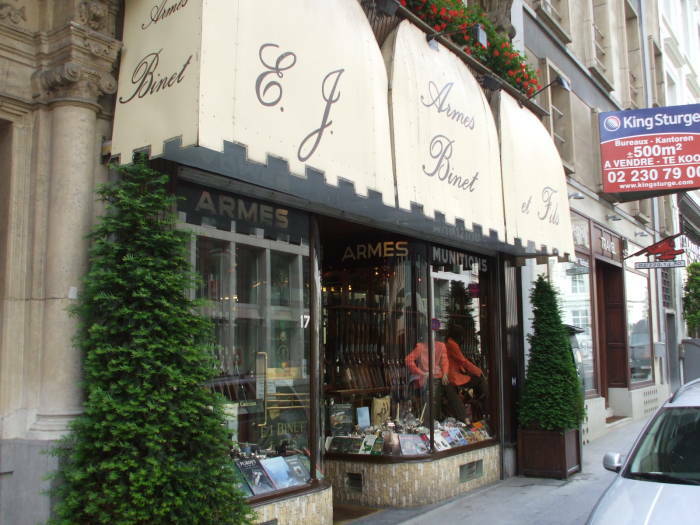 Another interesting place just two doors further down Rue Royal is Armes Binet, E.J. Binet et Fils, at no. 17 Rue Royale. It's the building with the off-white awnings. "Derrière une belle façade datant de la fin du XIX siècle (1876) est abritée l'une des plus belles collections d'armes de tous calibres." It's like something from a Frederick Forsyth novel, this is an old-school Belgian arms merchant. Well, maybe not like a Forsyth novel. More like an amalgamation of Fitzgerald and Hemingway. E.J. Binet et Fils outfits the very high-end safari market. Guns, clothes, and assorted safari accoutrements. One of the many hunting rifles in the window, with a "melted" style muzzle brake like the others, was a .416 Weatherby Magnum rifle priced at a cool 3875€. I was intrigued, but it did not seem to be the sort of place where you simply walked in and browsed. In fact, I got the idea that you only got in with a prior appointment. Victor Horta's last work was the rather ugly Gare Central. 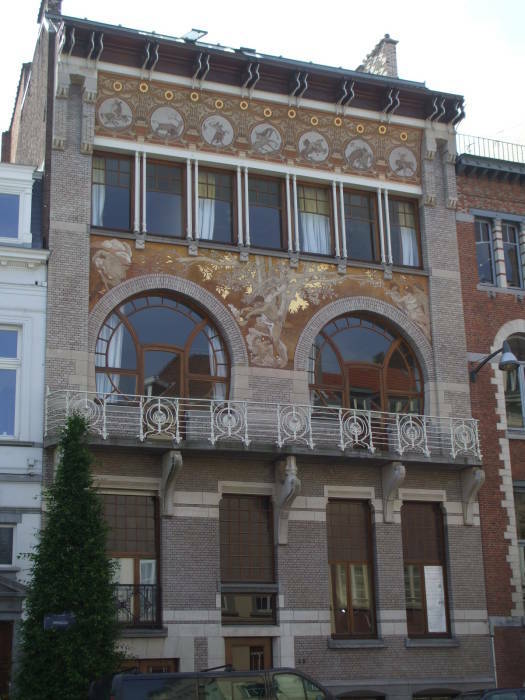 He designed it when Art Nouveau had been replaced by Art Deco. His 1912 design was kept until the station was finally built in 1952. It doesn't really seem that it was worth the wait, as this was not his best work.